I love watching Bubba Watson hit a golf ball. It’s even more fun now that the television coverage regularly includes replays that graphically show how much the PGA Tour star curves the ball with his well-timed hand action. His methods are a throwback to a time not that long ago when U.S. Open winner Corey Pavin moved his ball right, left, high, or low to make the most of his short-hitting repertoire. Watson and Pavin share something else in common. Both won the PGA Tour’s Los Angeles Open on multiple occasions, all at the Riviera Country Club’s historic layout. This course puts a premium on the player’s ability to plot their way to specific locations to give themselves the best chance to hit the tiny but firm greens. Those who can shape their shots have a distinct advantage. During this year’s tournament the announcers mentioned that Watson’s 2017 Tour performances were disappointing, with no wins and few highlights. They also highlighted the fact that Watson had been using a Volvik golf ball he endorsed, but its performance characteristics fought against his swing style. That ball is designed to promote a straight ball flight, and that’s not something Watson normally does. This year Watson switched back to the Titleist Pro V1x, a ball he used to twice win the Masters along with several other triumphs. During this year’s Los Angeles event, the difference was remarkable. Making a good choice of which golf ball to use is equally important for amateurs. Visit with a local golf pro to talk about your game and your best ball options. I last wrote about Ben Hogan golf clubs after the 2016 PGA Merchandise Show, where I looked into the company’s VKTR hybrids. I liked the club’s neutral set-up and the four adjustable weight ports. I also appreciated Hogan’s unique approach to club labeling that showed the actual loft and the 4-degree differential between each club in its iron sets, for two reasons. In my opinion, having each club identified by its actual loft (such as 34 degrees for a seven iron), was a great way to help golfers make the best club decisions for their game. In addition, the fact that some current 6-iron lofts are the same as 5-irons from several years ago was far too similar to the vanity sizing issue that plagues women’s fashion. Apparently I was in a distinct minority. The club loft labeling was not a hit with most of the golfing public. That problem combined with more traditional business challenges such as undercapitalization to force Hogan into Chapter 11 bankruptcy reorganization just before the 2017 Show. Scott White, a golf industry veteran, had been brought in as a consultant to the Hogan owners some time before that filing. As part of the reorganization to come out of bankruptcy, the company made White its President and CEO. The Hogan PTx forged cavity back irons are the company’s current best sellers. Last summer, Hogan announced its post-Chapter 11 reincarnation, the main feature of which was a clean break from its dependence on green grass shops and other outlets. Instead, Hogan now uses direct-to-consumer marketing via the Internet and social media, along with steep cuts in product pricing. For example, a graphite-shafted set of PTx irons (4-PW) is only $770, almost half the 2016 price. That discount was plenty of incentive for me, and I bought a PTx set late last summer. I am very pleased with their performance. When I met White at the 2018 PGA Merchandise Show in Orlando last month, therefore, I was both a golf columnist and a real fan of the Hogan line. Last summer, buyers could only purchase stock sets, but since then Hogan expanded their options. It now offers customization for length, lie angle, and grip size, among other details, with no upcharge for graphite shafts. 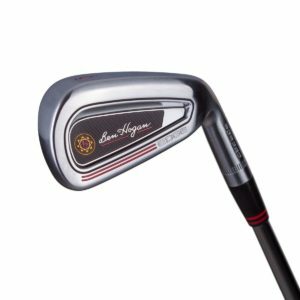 When I talked with Ben Hogan Golf CEO Scott White in January, he said the company would soon be coming out with new products. What he didn’t say was that their new clubs would harken back to some of the most successful lines Hogan ever issued. 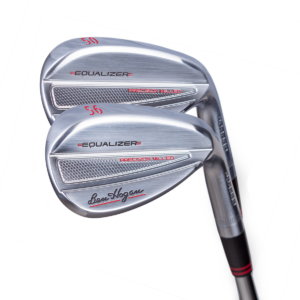 First, they brought back the forged Equalizer wedges, featuring design elements tailored to create the preferred ball flight that Hogan himself sought in his short game. The mass behind the lower lofted models is moved higher on the club face to help the ball stay lower and spin to a quick stop on the green. The mass behind the higher lofted models stays low to promote a steeper trajectory. Hogan’s V-sole design has also been softened a bit, with more bounce, to cover a wider range of turf conditions and player ability. The Equalizers come in a variety of lofts, from 48 degree to 62. Pre-orders are now being taken for delivery in the latter part of April, at $100 each. Today the company announced the return of their famous Edge irons in an updated design that should retain the brand’s reputation as a great game improvement-level offering. Several of my golfing buddies loved the Edge irons when they first appeared and the new version should be equally appealing. The forged cavity-back irons are made from two separate forged parts that are then laser-welded to each other. The mild offset should help golfers who have trouble bringing the club back to square. In addition, the irons are larger than the popular PTx line, by an average of 12%. The oversize feature should provided added forgiveness for mishits. Years ago, I played Titleist DCI+ Black irons that were 15% larger, and can vouch for the benefits of an oversized iron design. 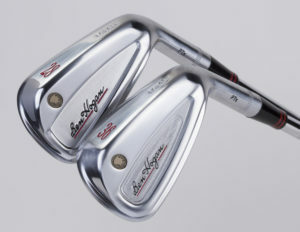 The company retained its commitment to the 4-degree loft gap for each iron in the set (4-PW), but are limiting the launch profile to mid-high lofts (22 to 46 degrees). White told me in January that this is the most popular launch profile for the PTx line, their current bestsellers. Other aspects of the clubs, such as grip size, length and lie, and steel or graphite shafts, are fully customizable. The clubs are offered at $735 per seven-piece set, and no-interest short term financing is available.